Long on my to-do list has been a web browser for TI graphing calculators. With the introduction of Doors CS 6 (and thence Doors CS 7's) GUI API features, then CALCnet protocol support, and finally the creation of globalCALCnet, this dream got incrementally closer to reality. Early yesterday morning, I decided to finally bite the bullet and throw together a CALCnet-based web browser. 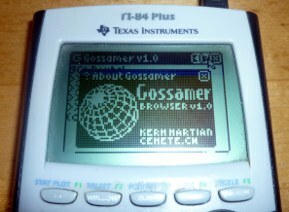 I first created a Python web clipping application employing Lynx that runs on the globalCALCnet metahub, then a calculator-side client named Gossamer. Gossamer can already request, receive, display, and scroll pages, maintain a page viewing history, and allow the user to click on links to visit pages. Coming soon will be a box to input arbitrary URLs as well as progress bars for page and reference loading. As always, please post your feedback and comments in the attached thread. A full version of Gossamer will be coming in the next few days, followed in the hopefully-near future by Doors CS 7.2, with the new and improved Direct USB CALCnet support that I demonstrate in the video below. Ohh, I was expecting this to be for the Prizm but this is equally awesome! ComicIDIOT: Potentially, but if I did, more work could be done calculator-side. First I'll need to port CALCnet. This, and This again. Amazing Kerm. In case anyone skimmed the news article, I should point out that this is running on a much-improved Direct USB implementation inside Doors CS. I'm hoping that I'll be able to share it with you guys in the form of Doors CS 7.2 very soon, although there are a few more glitches still to find. I'm hoping I'll be able to easily collate my notes on what non-networking bugs in Doors CS still need to be fixed for 7.2. Haha, thanks Souvik! Now you should work on CALCnet Tournament so we can have Cn2.2 programs by people other than me released. Well that's pretty amazing. Can't wait to have the hardware/software to try it. If I remember correctly, all you need is an Arduino, or a TI 84+/SE with a USB cable. With the advent of Direct USB gCn, all you need is software, a TI-84+/SE, and a direct USB cable. Wow, this is spectacular! It kinda gives me motivation to look into gCn for KnightOS. You should definitely do that. I've been trying to nudge AHelper to do the same for GlassOS, but without any luck yet. Wow, just wow. This is the day I have always dreamed of. Very nice and I can't wait to see what is to come. That's some fantastic work there Kerm! How do you plan to deal with ticalc.org's archives? Have the zip file parsed and the files automatically dropped onto the calc into flash? Holy cats, man. That's amazing. Wow you made this in one day!? Incredible. Epic work! © Copyright 2000-2019 Cemetech & Christopher Mitchell :: Page Execution Time: 0.201491 seconds.